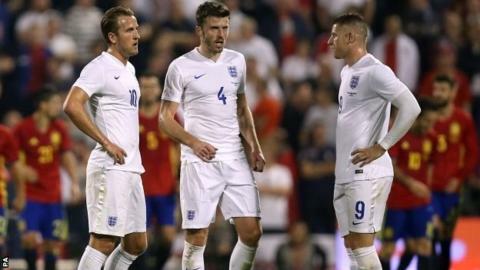 Defender Gary Cahill believes England were not outclassed in their 2-0 friendly defeat by Spain on Friday. Vicente del Bosque's European champions had 64% possession in Alicante, as full-back Mario Gaspar scored a stunning acrobatic goal. "I thought the result flattered them, even though they had a lot of the ball," said centre-back Cahill. England's friendly against France on Tuesday goes ahead after the terrorist attacks which took place in Paris. Cahill continued: "For 70 minutes, I thought we were well in the game but goals change games. It was a special goal and it opened it up. We knew it was going to be tough and knew the ability they had." It was a first defeat since the 2014 World Cup for England, who went through Euro 2016 qualifying with a 100% record. "People need to stay patient," said Tottenham striker Harry Kane. "We're not going to win every game. We're playing these teams for a reason, to get experience. "We've got to stay confident. We know what we want to do and what we want to achieve."